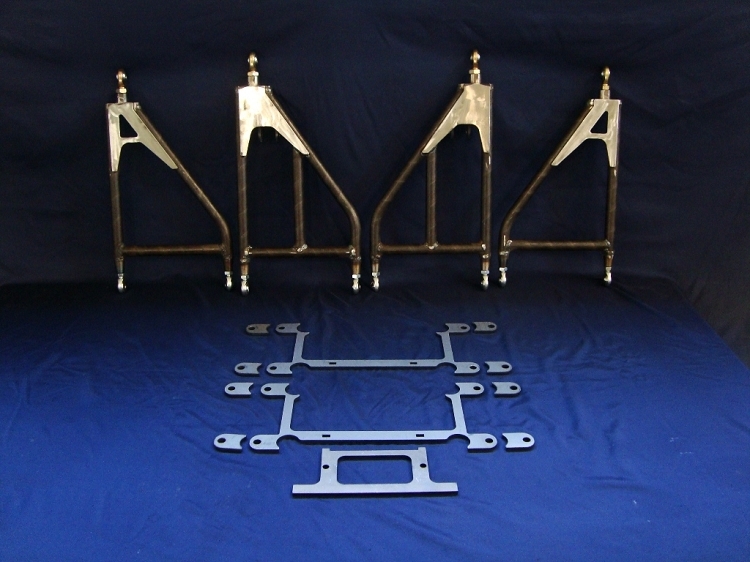 front a arm kit 1 1/2"
Kit includes: front A-arms, chassis mounting plates, and mounting plate for steering rack. **Heims are not included in the initial pricing. Please select the heims option if you would like those included with your kit. ** With this option you will receive 8 - 1/2" heims and 4 - 5/8" heims. This kit combined with other kits we offer can be used to replace your VW front beam suspension and turn it into a dual A-arm long travel or in a complete new chassis build. One of the most important & critical areas of off road buggies is the front suspension & steering. We have designed & developed a front A-arm kit, that will make one of the hardest areas to build on a buggy now one of the easiest. The A-arms are built in a jig for consistent performance & quality. The chassis mount plates are ¼” thick steel and are made so that the forward tubes lock them into place turning them into their own jig for perfect placement. These also set the right position for the A-arm heims locations. There is also a steering rack mount plate that interlocks with the chassis mount plates, to set the perfect position for the rack, and almost eliminating bump steer. These plates can be ordered for 1 ¼” tubing or 1 ½” chassis tubing sizes. Please check out some of our other kits to go with this one to complete your build. Full front kits are available to make your custom build easier, and give you premium performance from the start.